1980-04-10 Lyceum Ballroom, London, UK I. 1980-05-01 Lyceum Ballroom, London, UK II. – version 1 mislabeled as ‘Electric Ballroom’. 1980-05-22 Rotterdam ??? wrong date/venue ??? 1980-06-26 Music Machine, London, UK II. 1980-08-20 Rafters, Manchester, UK I. 1980-10-22 Rafters, Manchester, UK II. 1980-10-26 Opera House, Northampton, UK – version 2 mislabeled as Granary, Bristol 80-10-15!!! 1980-11-20 Paradiso, Amsterdam, Netherlands I. 1981-03-30 Heaven, London UK – version 1 different rec. 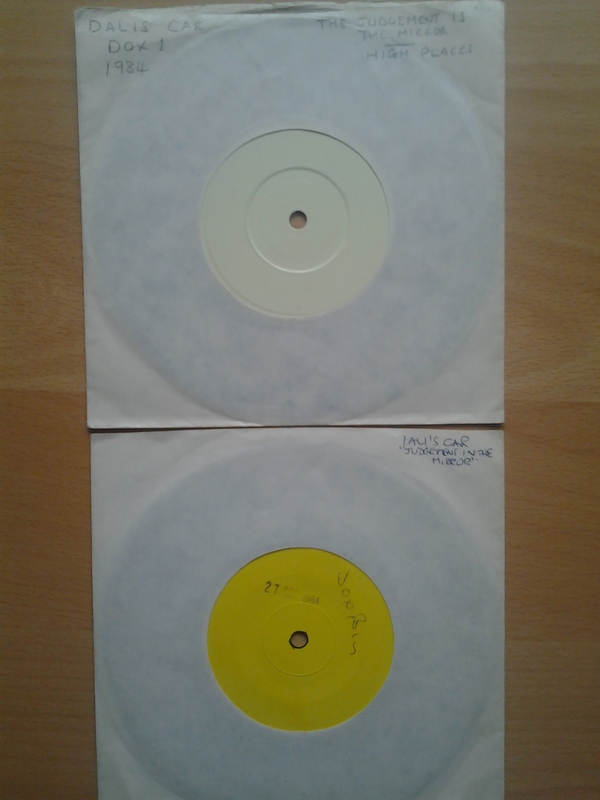 1981-03-30 Heaven, London UK – version 2 master (D) – different rec. 1981-03-30 Heaven, London UK – version 3 TB AUD MASTER (2013) – different rec. 1981-06-18 Royal Court Theatre, Liverpool, UK I. 1981-06-19 Rock City, Nottingham, UK I. – version 3 TB AUD MASTER (2013) – different rec. 1981-06-20 Friars, Aylesbury, UK I. 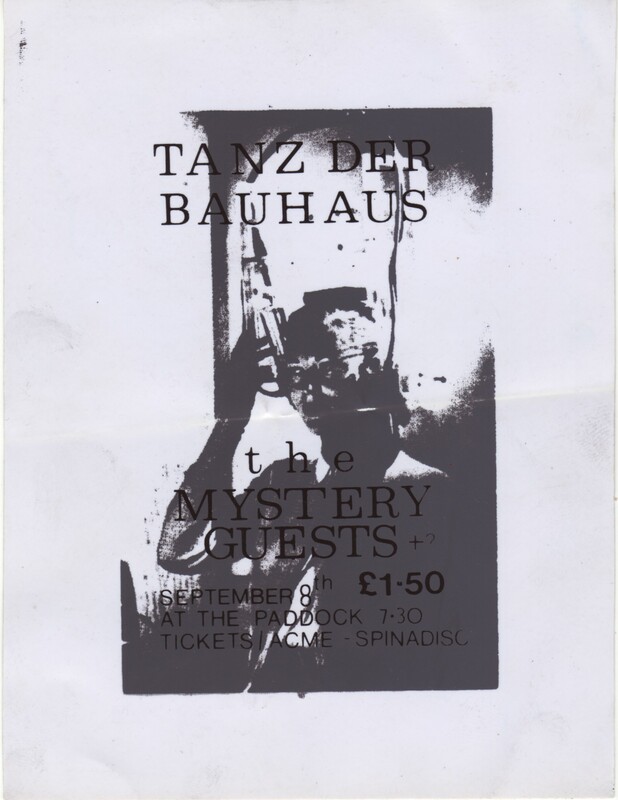 1981-06-23 Tiffany’s Ballroom, Leeds, UK – version 2 TB AUD MASTER (2013) – different rec. 1981-06-25 Lyceum Ballroom, London, UK III. 1981-10-24 University Of East Anglia, Norwich, UK I. 1981-10-25 Civic Hall, Guildford, UK I. 1981-10-27 Locarno, Birmingham, UK I. 1981-10-28 Fagins, Machester, UK – version 3 TB AUD MASTER (2013) – different rec. 1981-10-31 Royal Court Theatre, Liverpool, UK II. 1981-11-07 Rock City, Nottingham, UK II. – version 1 diff rec. 1981-11-07 Rock City, Nottingham, UK II. – version 2 diff rec. 1981-11-07 Rock City, Nottingham, UK II. – version 3 TB AUD MASTER (2013) – diff rec. 1981-11-09 Hammersmith Palais, London, UK I. 1982-04-23 Imperial Cinema, Birmingham, UK – version 2 TB AUD MASTER (2013) – diff rec. 1982-04-24 University, Leicester, UK – version 2 TB AUD MASTER (2013) – diff rec. 1982-10-13 University Of East Anglia, Norwich, UK II. 1982-10-17 Guildhall, Portsmouth, UK II. 1982-10-19 Rock City, Nottingham, UK III. – version 2 TB AUD MASTER (2013) – different rec. 1982-10-21 Lyceum Ballroom, London, UK VI. – version 2 TB AUD MASTER (2013) – different rec. 1982-10-22 University, Salford, UK – version 2 mislabeled as Victoria Hall, Hanley 82-10-24!!! – different rec. 1982-10-22 University, Salford, UK – version 3 TB AUD MASTER (2013) – different rec. 1982-10-23 Odeon, Birmingham, UK – version 2 TB AUD MASTER (2013) – different rec. 1982-10-27 De Montfort Hall, Leicester, UK I. 1982-10-29 Lyceum, Sheffield, UK II. 1983-06-11 Friars, Aylesbury, UK III. 1983-06-21 De Montfort Hall, Leicester, UK II. 1983-07-03 Locarno, Birmingham, UK II. 1983-07-04 Hammersmith Palais, London, UK III. 2006-08-07 Forum, London, UK I. 2006-08-14 Lignano Rock Festival, Lignano, Italy MP3 sourced? 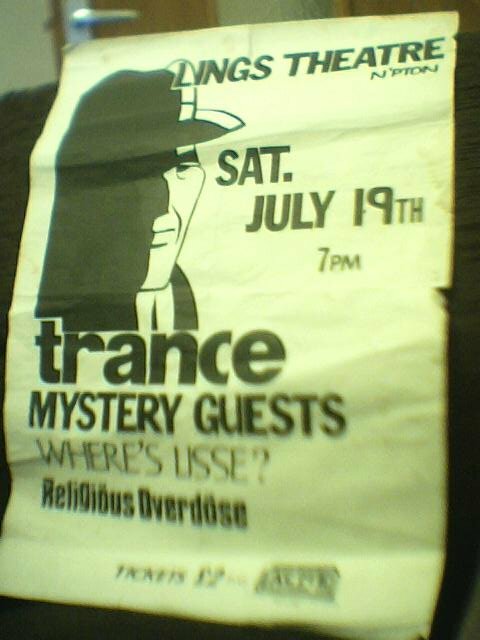 1998-08-27 The Riviera, Chigago, US – I. 1998-08-28 The Riviera, Chigago, US – II. 1986-11-06 The Metro, Boston, US – version 1 Club Spit?? 1989-09-05 Aragon Ballroom, Chicago, US – version 1 – CD 1 or 09/15??? 1989-09-05 Aragon Ballroom, Chicago, US – version 1 – CD 2 or 09/15??? 1989-09-26 Ritz, New York City, NY, US I. 1989-09-27 Ritz, New York City, NY, US II. 1986-10-03 Vernier, Geneva, Switzerland incomplete recording, SBD ??? 1987-02-22 Metro, Chicago, US I. 1988-05-06 Metro, Chicago, US II. 2009-07-07 Highline Ballroom, New York, US – II. I have started working on this project back in 2010. 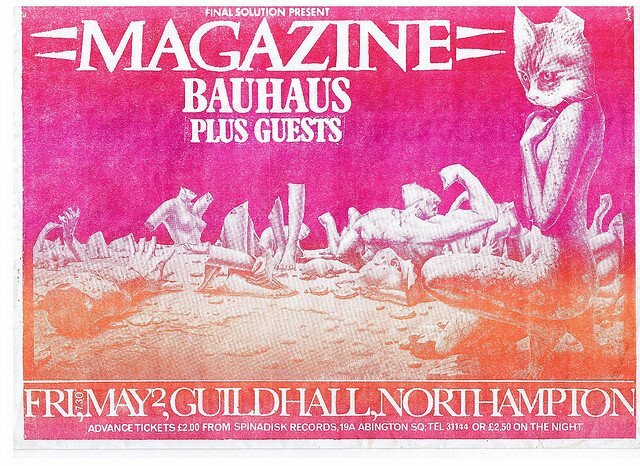 My original idea was to compile Bauhaus live rarities including unreleased tracks and cover versions but later I decided to add related bands (Love & Rockets, Tones on Tail) and solo stuff (David J, Daniel Ash, Peter Murphy) as well. I went through my bootleg collection and turned out to have about +150 tracks. I finished with a 3 CD set of David J material and one disc of Love & Rockets / Tones On Tail / Daniel Ash back then and also did initial track selection for the Peter Murphy discs. Unfortunately I haven’t had time to make it complete till now. Now Peter Murphy and Bauhaus discs are done. The full set contains about 11,5 hours of music (161 tracks). I had a rule to add just UNRELEASED original songs, cover versions and self-covers (Peter Murphy’s versions of Bauhaus songs, David J’s versions of Love And Rockets & Bauhaus songs etc.). There are a few exceptions (marked with red). However, most of them were added before they got released. Please note, this page is intended for informational purposes only, I’m not selling or trading the CDs (except the 3xDavid J CDs). But several recordings I used could be found online so feel free to use it as a guide and make your own compilations. Track 07 – Incomplete ‘Shows’ was released on ‘Live In The Studio 1979 CD’, but this one is the full length version. Track 07 – Peter Murphy’s solo version is available on Mr Moonlight Tour: 35 Years of Bauhaus DVD (2014) . This ‘Hundred Man version has a 2 min long intro. Track 13 – Studio version is available on Should The World Fail To Fall Apart 2011 reissue . Track 17 – Studio version was released as iTunes single in 2009. Live version was played during Dust (2002), Secret Covers(2009) and Dirty Dirt (2010) tours but this take is an early one-off take from 1990! Track 04 – Peter Murphy’s solo version is available on Mr Moonlight Tour: 35 Years of Bauhaus DVD (2014) . This version is an ad-lib improvisation piece. Track 12 – Studio version is available on Ninth (2011) album. This live version was played during Dust (2002), it has very different arrangement than the released one. Track 05 – Studio version is available on 5 Album Box Set (2013) . Track 10 – Live version (from 2007) is available on Strummer, Joe – Tribute Concert: Cast A Long Shadow DVD (2011) . Live version was played during the second leg of 1989 tour and later on few 2007 / 2008 gigs. Track 14 – Studio version is available on 5 Album Box Set (2013) . Live version was played in 1985 / 1986. Track 18 – Studio version is available on Anthology (2013) . Live version was played in 1993. Track 19 – Studio version is available on Weird Pop (2011) . Live version is also available on Everything! but I prefer this live take. Track 21 – Studio version is available on Burning Skies, Everything! and Weird Pop (2011) . This desk master version has been added as a filler track just because it sounds good enough. Track 01, 04, 05, 11 – Studio versions are available on Not Long For This World (2011) . Track 02 – Bauhaus’ live version is available on Rest in Peace (1992) but this take is my personal favourite. Track 07- Studio version is available on An Eclipse of Ships (2014) . Track 09 – David J’s solo studio version is available as digital download. Track 01 – David J’s studio version is available on Missives From The Burning Stage (2014). Track 02, 08 – Studio versions are available on Not Long For This World (2011) . Track 07 – David J’s solo studio version is available as digital download with Who Killed Mister Moonlight? (Bauhaus, Black Magic and Benediction) book (2014). Track 10 – Black Francis’ version is available on New Tales to Tell: Tribute to Love & Rockets (2009) . This live version is by played by Black Francis, David J and Kevin Haskins. Track 11 – Full length live version is available on Missives From The Burning Stage (2014). Track 15 – 18 – Bonus tracks. 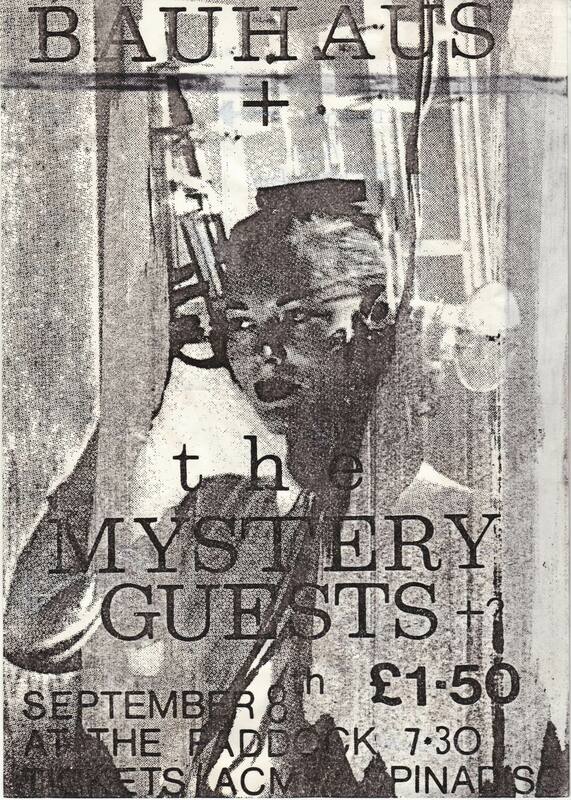 The original Mystery Guests were just 3. Buster, Alex and myself. Alex then left to join the Army and we had an almost never ending series of one-night sax players. Later Punky alias Titus Aaron joined on bass. „And then came the breakthrough. In 1979 Licquorice resolved the sprawling ambiguity of the Dapper Choir into a hard and lucid whole. With the aid of a near-terminal Akropolis he recruited the shabby, eccentric and comically-named Buster as lead guitarist. Buster lived in subhuman squalor, nut was an electronics genius who could convert a vaacum-cleaner into a particle accelerator using only a wall can-opener. Before fong the trio metamorphosed into a quartet with the arrival of bassist Titus Aaron. In many ways the most enigmatic of the group, Aaron shared a strange physical similarity with his fellows… a baffling, haunting uglyness that hovered on the edge of sublime ethereal beauty. The Mystery Guests were now ready to submit themselves to the bloodshot scrutiny of the general public. Wurlitzer Junction also appears on “Nation of Saints, 50 Years of Northampton music” compilation CD that came with the very first issue of Alan Moore’s Dodgem Logic magazine in 2009. CD includes songs by Alan Moore, The Jazz Butcher, Tom Hall, Venus Fly Trap and David J. Early version of Wurlitzer Junction was written back in April 1978 by Pickle & Alex Green for The Emperors of Ice Cream / The Dapper Choir. Instrumental home demo has been taped. Alan Moore contributed with lyrics later. Are you all relating to? In time to the tread of empty shoes? Where ambulance men give empty views. You never hear the bomb that hits you; anaesthetic. Here’s a steady man with thoughts like shrapnel. the Merry Shark you are. Born at best on best-forgotten days? Lyrics in green are Alan’s, the others mine. I wrote all the music. For Wurlitzer Junction I sang the first thing that came into my head while playing electric guitar and Alan seated over the other side of the room wrote down his impressions from what he could hear. So in a sense I guess they belong to both of us. „One such aesthete was the astute Tom Fawcett, prolific eminence gris behind, amongst other things, Fawcett’s Design for Living. Recognising the Mystery Guests as a potential ultimate deterrent in his arsenal of cultural subversion. Fawcett cunningly contrived that their first single, “Wurlitzer Junction’, should be released upon his fledgling Boy’s Own label. There were several stanzas of deft linguistic beauty, although I most admit that my personal favourite was the one which rhymed ‘bachelor’ with ‘manufacturer’. „The artistic intelligentsia in Northampton is pretty closely knit, due largely to the fact that there’s only about six of us. 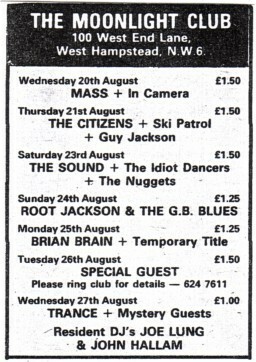 Oh yes at the Moonlight club gig – Steve Cook and Paul Jones, then in the Professionals, people from John Foxx’s Metalbeat label and half of Ultravox were in the audience. Watching Mystery Guests rehearse was strange – they had a gizmo they could all plug into and wore headphones so they could hear each other play without need for amps but onlookers could only hear the vocals and the sound of unamplified guitars. The next single was done on a farm somewhere. We recorded ‘The Sparrow that ate New York’ and two other songs. Wurlitzer Junction and The Sparrow That Ate New York were both released on my BoysOwn label of course, and I do recall going to a recording session at Wild Willy Barret’s place in Northants, but I’m not sure either we’re recorded there. We did a freeform session there with members of Stanton Walgrave and Tom and his mate and then later we did ‘the Sparrow that ate New York’ there. I think Shrivs and I only did a couple of gigs with MGs but there was lots of other things which I may be confusing with Stanton Walgrave 4 or 5 years earlier. We were involved in the farm recordings at Wild Willy Barrettes place. This included reworking of some some of Shrivs lovely songs such as Bend me like a tambourine. 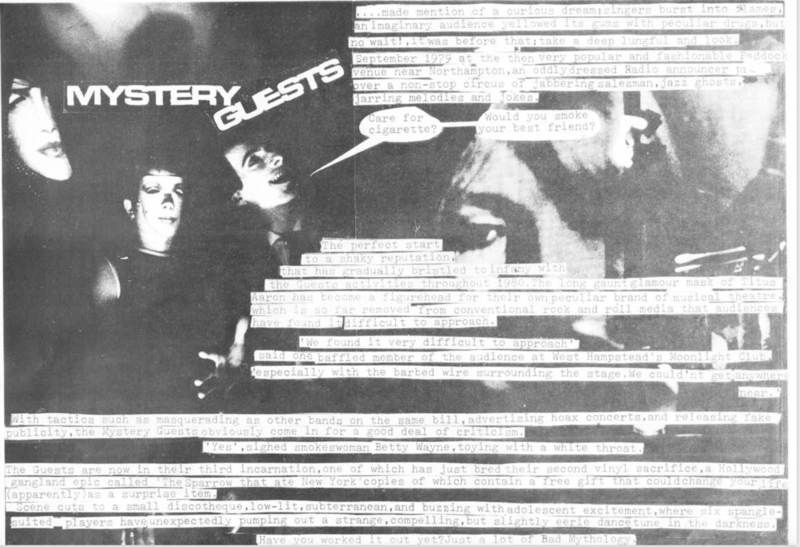 „It is interesting to reflect that at this point, reduced to en avant-garde duet of limited commercial appeal, the Mystery Guests might simply have vanished without trace, thus averting the soul-chilling catastrophes that were to follow. But it was at precisely this point that History chose to deal it’s most brutal card by engineering the return of Seaweed and Spawnwash. They were not the men that Mr. Licquorice had known of old. Seaweed now had prominent gills and a vestigal dorsal fin. Spawnwash had become a communist, converted by his patronage of Radio Albania. But they were to have seismic repercussions upon the very raison d’etre of the Mystery guests. Music alone could no longer contain them. They were filled with an unholy zeal, urging them to spread their blight across the entire cultural firmament. 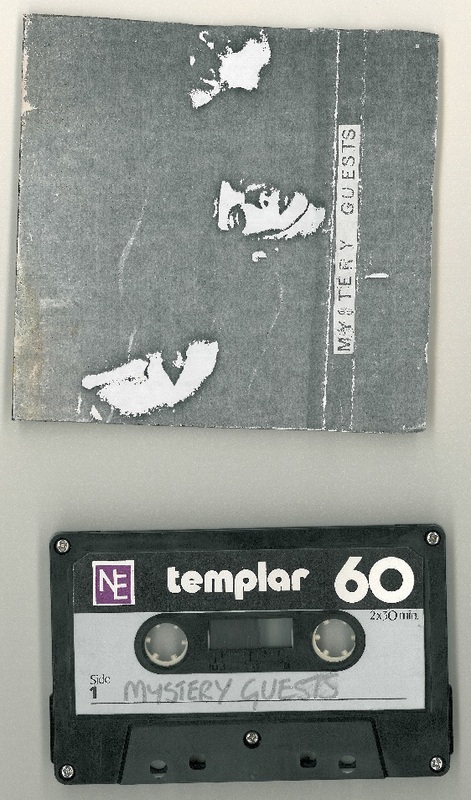 A cassette and booklet package entitled ‘The Bigot’ was released, voyeuristically detailing the real-life xenophobia of an anonymous and unwitting middle-aged couple. The born-again Max Akropolis lurked ominously in the wings with a full brass section. Betty Wayne and her Lady Choristers waited demurely to take the field. And there were new songs… the lovely and heartbreaking “Don’t Treat Me Like A Treacle Tart”, the clammy and seductive “Corrugated Fever”. The mystery deepened. The guests prepared to eat the party. Much later after Buster left, we teamed up with two old Stanton Walgrave chums Seaweed and Shrivs (yes Spawnwash) and Alex returned for a final couple of gigs, this time on guitar, i think. ‘The Bigot’ I don’t remember who found it but in those days we all used to hunt round the junk shop for those old Grundig reel-to-reel tape recorders. We were into tape loops a lot then. Anyway this tape came with one of the machines we bought and it was one of those tape letters people used to send to distant relatives. A middle-aged couple speaking to their son in Australia, describing their everyday lives and revealing almost unrepeatable xenophobia, quoting Hitler even. Just ordinary folks you pass in the Supermarket. So anyway we had plans to release it as a social document, sent it to some labels even. Then at some point the original got lost and the project became just another myth. Again I was the main songwriter. Song 8 was an adaptation of The Whore’s Poem by Alan Moore. All the other stuff was mine i think. I think the MG gig is at Warwick University with Fawcett’s Design for Living. The date…? 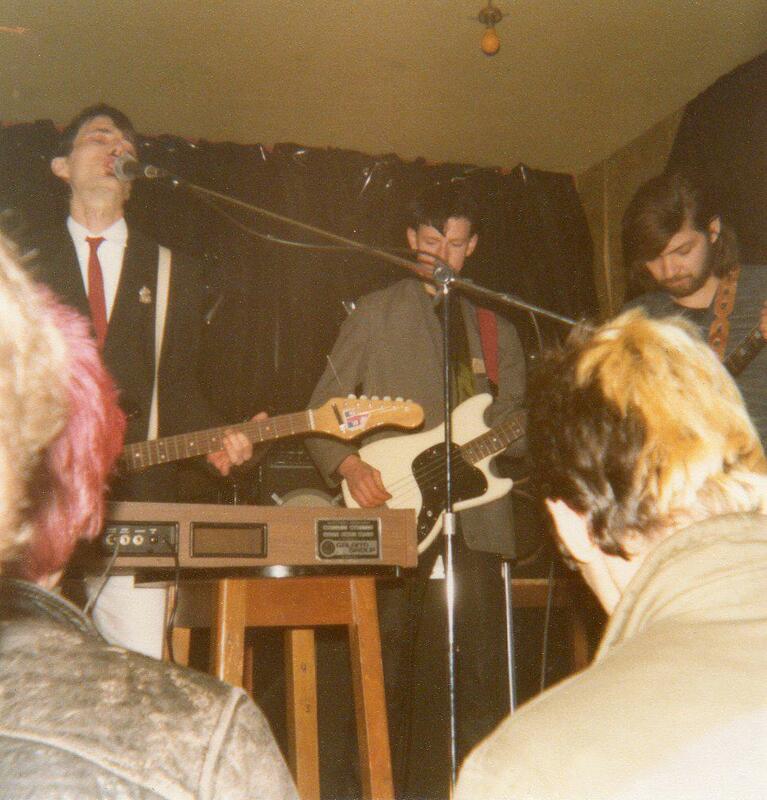 Line up was me on guitar and electric piano, Buster on guitar, Punky on bass and someone else(Paul?) on sax and xylophone. Line-ups were always changing. No-one could stand it for very long..
My band certainly played live with them, I remember playing Warwick university, from which the live cassette ‘Jumping off at the elephant’s nest’ derives.